The History Of The Whitewall: Part 2! So after writing yesterday’s little side bar on whitewalls, I decided it would be fun to post the article that spawned it (originally published in Hot Rod Deluxe Magazine). Although the writing is embarrassingly bad, it does feature some pretty neat interviews with Barris and Roth. Dig it. Cruising down the boulevard smokin’ a Lucky as the hop ups fly you by. Listening to something silky smooth while your arm hangs out that chopped box and your freshly tattooed sleeve dries in the wind. We all live for the image and feel the same jive. There are indeed a lot of necessities for the completion of this look and even more for individuality, but one attribute remains a constant in the stable of hot rodders and customizers – the whitewall. Whitewall rubber can be found as far back as the early 1900s when a small tire company in Chicago produced one of the first versions for their horse and chauffer drawn carriages in 1914. Even these early birds knew the direction of the tire – naming them “Custom Builds�?. However, it was not till the late 30’s that the tire began seeing action in the form that we know them today. Old schoolers, like George DuVall (of windshield fame) and Glen Hauser (of Carson Top fame), used them to cap off their early, tail dragging creations. From nasty little ’36 roadsters to deco-styled model 40 coupes, almost all customs of the day left the shop rolling on 3-inch or wider white stripes. What is your first memory of the use and application of whitewalls? Well, that goes back to the early 40s when guys were using porta-walls and the like just so they could get the widest whitewall possible. You know, they would just stick these rubber inserts in between the tire and the wheel and go. As far as customs, there were hardly any without whitewalls – they were the “in�? thing. I had black walls on my roadster, but I had white walls on my ’36 because it was custom. Tires and wheels were important to us; they were probably the first two things that we started to customize. Before you bought a new car you already had an idea of what you were gonna use for wheels and tires. As the 50’s came along how did the use of whitewalls and tires in general change? There were a lot of changes in the 50s. At first, the real wide whites were popular. You know, you would just buy or make the widest whitewall you could. By this time of course, a lot of manufacturers were already making 3-inch and wider whitewalls, so painting techniques and recaps were not as popular, but on the all out customs you would do what ever it took to get the look. Towards the later 50’s and as the Bellflower look became popular, smaller whitewall designs became more prominent. At first all we had was 16�? wheels, but now we had 14 and 15�? wheels, so we had a lot more options as far as tire sizes and styles. By the early 60’s, a lot of guys were running real skinny white stripes and sometimes they would even have three separate ¼-inch stripes on the tire. What other mods would you make to the tires themselves? One trick we used to do that you don’t see that much anymore is the use of raised letter tires. We would cut out all the different letters and use them on our own cars to spell out the name of the car or the shop where it was built. 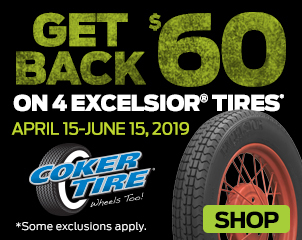 If we couldn’t find a specific letter on a tire, we would just cut the letters out of white rubber and rubber cement them on. And then of course, we started actually color coordinating the tire to the car with different shades or reds and golds depending on the application. Again, the factory guys were watching cuz not long after this, red lines came out. Obviously, the hot rod guys always went for the big-and-little combinations on their cars, but what did custom guys run typically? While custom cats were cruisin’ slow and looking cool in Barris styled sleds, the hot rod crowd was busy wrenching and tuning, trying to fulfill their quest for every last bit of horsepower they could squeeze out of their jalopies. Because of cost considerations, whitewalls were fairly rare on a 40’s-era built rod, but by the 50’s everyone was jumping on the wide white bandwagon. Not oblivious to looks, many of the nicer street roadsters of the early 50’s and late 40’s ran wide whites. Guys like Gil Ayala and George Barris both built customer rods featuring wide whites, but it was not until the “custom rod�? movement of the late 50’s and early 60’s that whitewalls became prominent on hot rods. Hammered and primed a-bones sporting Radir 5-spokes and wide whites were the norm and who could argue? 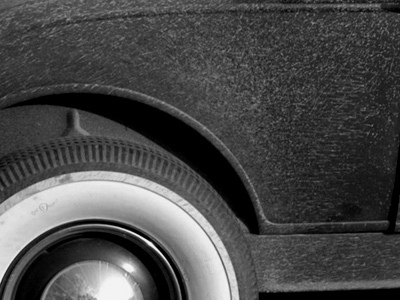 The newly invented cast wheels were a natural for a set of big and little whitewall tires. The aforementioned custom rods came along way starting in the late 50’s and into the early 60’s due primarily to one man’s crazy visions. Ed “Big Daddy�? Roth was just kooky enough to excite a new subculture in rodding – Rat Fink! While many of Roth’s cars did not sport the white rubber of choice, some of his wackiest conceptions did. The notorious “Mysterion�? used recapped whitewall slicks to accentuate the nasty rake and attitude of the car, while the ever-so-cute “Tweedy Pie�? roadster used typical wide white bias-plies. The reason? Only Big Daddy himself can answer that question. After hearing Barris’ first recollection of whitewall tires, we just had to hear yours. My first memory of whitewall tires were on my baby buggy. My mom and dad lived in Beverly Hills and spent a lot of money to keep up with the neighbors. I had a pretty cool baby buggy man! In 1941, after the war started, you couldn’t buy tires, so people painted the whole tire to keep it from getting moldy. In 1945, we could buy tires but people still dug the look of painted tires. Pep Boy’s came out with white sidewalls after that – it was the big thing man! What do you think attracts customizers like yourself to them? I mean, why do cats dig whitewalls so much? The attraction to customizers was obvious man. What’s cooler than a wide fat stripe down a tire? A narrow one? I dunno, what is cooler? A wide white or a narrow stripe? I got vulcanized into narrow whites man. Vulcanized! For one thing, they are easy to maintain! You used whitewall tires more sparingly than other cats of the time. It seems like your cars featured the tires only when the overall design demanded them. What, in your opinion, is a good example of the style that dictates the use of whitewalls? The reason I used whites a bit less than everybody else was due to the fads of the time. SoCal was the leader in FADS!!! One week, black walls were the big thing. The next week, everybody wanted skinny stripes. The only thing that remained constant was the actual size of the tire. You know, hot rods had the bigens and the littlens while customs had the same size on all four corners. 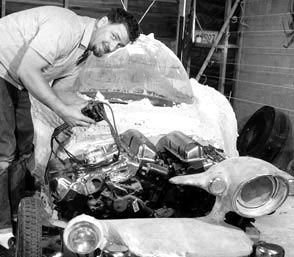 In the 40’s and into the 60’s, cats like George Barris and Ed Roth started an art form. They used sawzaws, welders, and hand tools as brushes and antique steel as canvases. Their masterpieces: the Hirohata Merc, the Mantraga ’40, the Beatnik Bandit, and the Mysterion, all had one element in common – whitewall tires. Whitewall tires serve more than just a functional means to put power to the ground comfortably and efficiently. They are more form than function – a visual explosion of simplicity and style when used appropriately. Barris said it best. “Whitewalls were something we knew were right. We didn’t even question it…�?